Well this is certainly... different. The ability to fly is theoretically an advantage, allowing free movement in all directions with the directional pad. 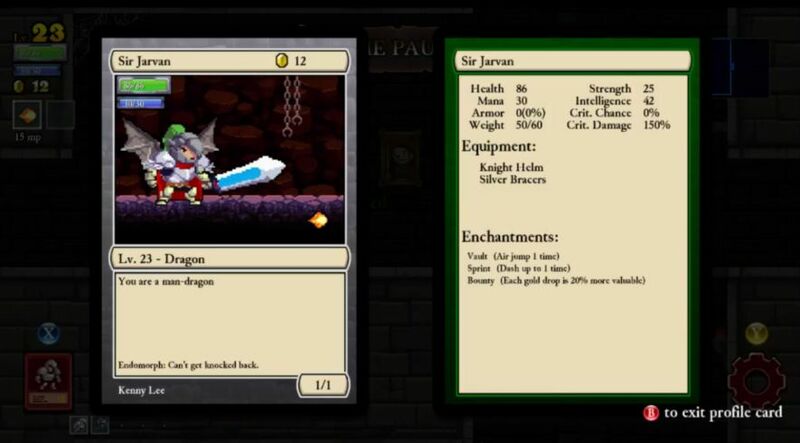 Unfortunately, after untold hours playing Rogue Legacy with characters who jump their way through the dungeon, moving the Dragon class can be more confusing than helpful. It requires a completely different thought process compared to the other classes. I knew that I was going to struggle for some time wrapping my head around how to maneuver these Dragons properly. The breathing fire thing is also quite interesting. 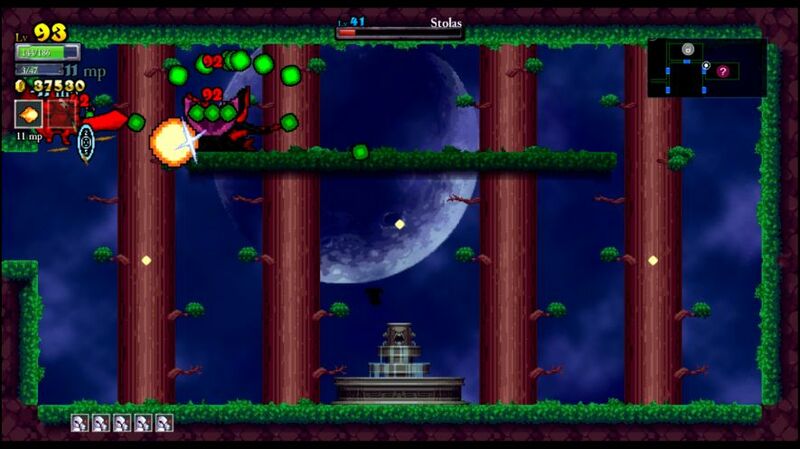 The fireballs have decent range, and I'd say that they will cross about a third of the screen before disappearing. This allows your character to attack from further away than normal, a good thing given the frail health of the Dragon class. However, it's not all peaches and cream here either. Dragons can't swing their sword even if they want to do so. They have to use the fireball breath attack no matter what, and that's not always a good thing. The fireballs shoot in a straight horizontal line, which means that Dragons have huge problems hitting monsters above or below them. The normal sword attack is excellent at hitting things above your head, and you can do the pogo stick downward strike too. Neither is a possibility here. 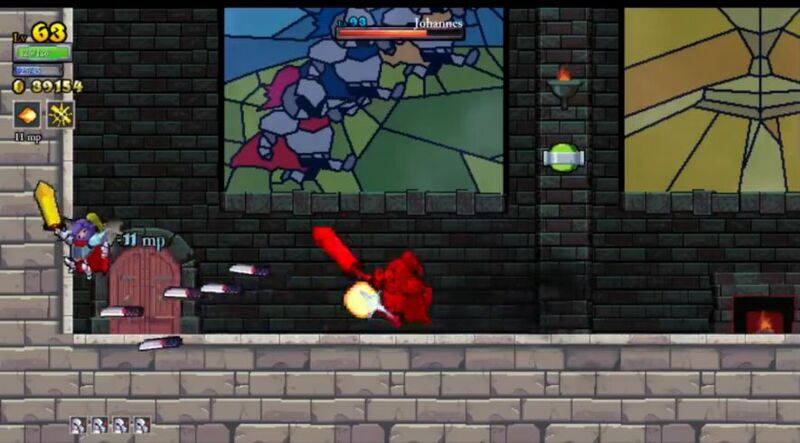 The fireball also will not go through walls, unlike the sword attack. And finally, the fireball can only hit one target at a time, much like the dagger spell. In a crowded room, with monsters coming from above and below, the Dragon is in a lot of trouble. You'd better be pretty good at dodging stuff with the innate flying ability! The base stats of the class are even worse, painting an ugly picture indeed. Health begins at 40% of the default value - only forty percent! That's worse than the Miner's 50% value, and very similar to the Lich's 35% starting health. At least the Lich can increase that total by killing monsters along the way. The Dragon has no such luck, he or she is stuck with a health value even worse than the Miner. Mana is similarly gimped, with mana starting at only 25% of the default value. This is ameliorated by the fact that mana regenerates quickly on its own for the Dragon class, but it's still a major problem since every fireball costs mana to use. You can use one or two fireballs at first, then you have to wait two seconds before you can attack again. This is a problem - no one ever stops the other classes from the ability to swing their swords! It seemed obvious to me that I would need to invest a lot of upgrades into the Mana Up stat for extended fights, to prevent my Dragons from running dry on magic almost immediately. Overall then, this is a pretty weak class, and definitely a major challenge. I was going to need to do some major work just to unlock the class, since I estimated it would take at least 10,000 gold to knock out all of the prerequisites on the unlock tree. Hopefully I could get some good runs with the default starting characters. Let's begin. I was hoping for a good initial outing from Sir Lee, and this run delivered in spades. The hardest part about setting out with a new character is the lack of the double jump and dash abilities. That's even more punishing than the loss of Vampire Runes for constant lifesteal. As an example of this, I had to pass through a room with one of those layouts where you must down-attack floating platforms over a floor of spikes, with fire also raining down from the ceiling. 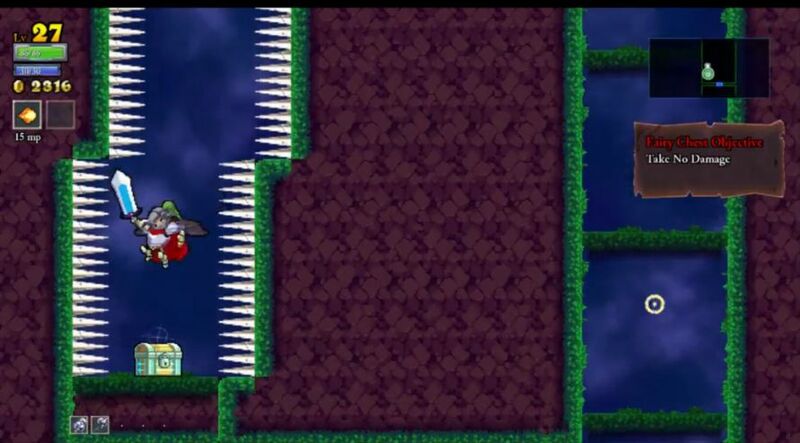 That's tricky to do normally... and almost impossible without the double jump ability. I took 40 damage here, and without lifesteal that was a huge setback. Fortunately, this run was extremely generous when it came to chicken drops. I found recovery item after recovery item, restoring Sir Lee back to full health multiple times. I also pulled the Hermes Boots item out of a secret shrine, which allowed me to walk across spikes and skip some of those dangerous platforming sections. I had 2100 gold in inventory when the castle was completed, and moved smoothly from there into the forest. The draw seemed to be on the easy side, that or I was playing unusually well, since I took few hits and made excellent progress. I was even able to use the dagger spell to take out the wolves from a safe distance. This run managed to fully clear the forest as well, which I believe was a first for me with Sir Lee. I ate all of the remaining teleporter chickens and headed into the tower at full health. I'm afraid that I didn't make it that far up there, as a Level 0 Knight with no double jump or lifesteal was really pushing it against the monsters. Six hits to kill an ice mage was getting silly. In the end, this resulted in more than 6000 gold, an incredible starting run. The plan for all that money was to unlock as far over towards the Dragon class as possible, and see what was left over after that. It took 12 full upgrades costing 5500 gold, but I made it all the way to the Dragon class unlock. The class itself cost a further 5120 gold, so it would take at least one more run to get the fire-breathing lizards in play. That was way better than I had expected to do, however. I just needed another 5000+ gold run and the Dragon class would be unlocked. (Easier said than done!) With the remaining gold, I had just enough to pick up the double jump and dash runes, with a mere 35 gold remaining. What a weird-looking unlock castle I had this time! Knight with Ectomorph and Baldness. I picked another Knight as the best class option of the three available. This run seemed to be star-crossed right from the beginning, with the first three treasures chests that I came across all uselessly locked behind walls (only a character with Dwarfism could get them). There was also a total lack of recovery item drops; whereas the previous run found about eight chickens in the castle, this time I found a single one. I was still playing at a pretty high level, there simply wasn't much appearing from drops, either health items or gold. This time, a full clear of the castle only produced 1300 gold, roughly 50% fewer than the previous character. 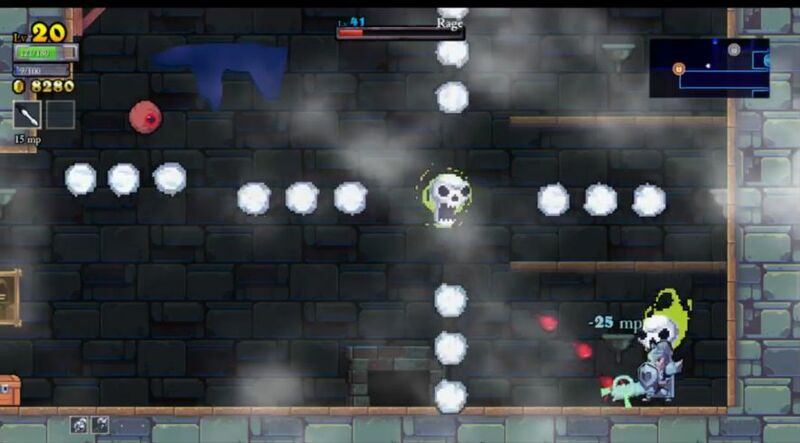 Rogue Legacy is like that sometimes, full clearing the same area can produce wildly different amounts of money depending on how the dungeon gets randomly generated. I also found a couple different pieces of Knight gear in treasure chests, which was good in theory but every chest with equipment inside was one that didn't have gold inside. That added up over time. I knew that I was going to have to make it deep into the tower to reach that elusive 5000 gold target. In any case, I didn't even make it that far. A room with a trio of fire mages managed to hit me for 48 damage from a single fireball (not a lot of room for error at the start of the game!) and then a ball and chain monster just barely grazed my foot in the next room for a kill. 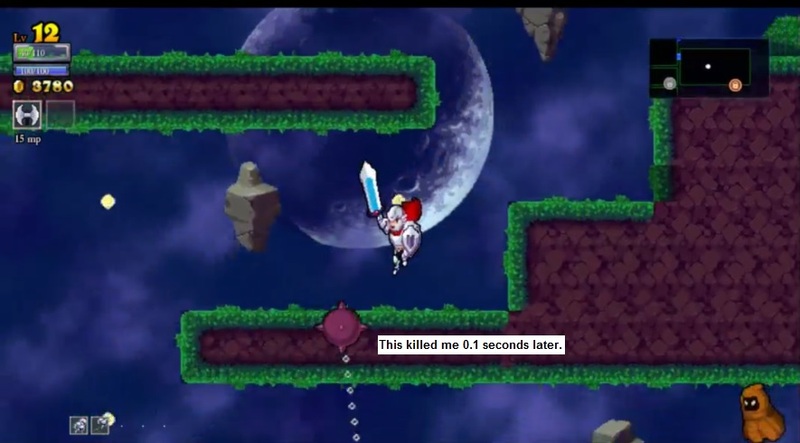 It was a really dumb way to die, one of those situations where Rogue Legacy gives you almost no chance to react in time. Bah. Lacking enough gold to unlock the Dragon class, I sunk the funds into a Gold Gain upgrade and then seven points of health. That would do the most to get me over the barrier on the next run. Knight with OCD trait and the blade wall spell. I didn't intend to keep taking Knights for these characters, they happened to be the best choice in each case. I guess it was oddly appropriate in some sense, using Knights to unlock the Dragon class. Anyway, this character seemed to inherit all of the good luck that my previous Knight had been lacking. Lady Shanoa had 180 HP to work with, she restored magic points with every broken pot and candlestick from the very helpful OCD trait, and she even gained 10% more gold from all sources thanks to that Gold Gain upgrade. I found treasure chest after treasure chest throughout the castle, passing the previous character's gold total within the first half dozen rooms. A full clear of the castle was worth 2900 gold this time! Even discounting the Gold Gain upgrade in play, it should be clear how much more generous this run was being. I found several more runes (nothing useful though), won the dagger throwing minigame (for the Blood Bracers - ugh), and eventually full cleared the forest again with plenty of health remaining. I made it into the tower and kept right on going, getting through a good portion of the upper area as well. With this being the third Knight character in a row, I was getting back into the swing of using that class, breaking out the special Shield ability to block damage and everything. The one restraining factor was damage; I was still dealing only 25 damage per swing, which meant that the enemies in the tower took quite a while to defeat. Eventually I took two hits in a row in a room with multiple fire traps, each hit did 62 damage (! ), and that was that. It was an incredible run from start to finish, and I actually wound up with significantly more gold than I needed. The Dragon class was unlocked with another 5000 gold still to be spent! I used it on the second Gold Gain upgrade, some new equipment, and a final point in health. It was time to unleash the Dragon! First Dragon of the run! And what an anticlimax it turned out to be. I was terribly thrown off balance by the weird flying movement of the Dragon class, and took hit after hit in the castle. This run ended almost immediately with a pathetic 444 gold total. Ummm, whoops? Not much "unleashing" here. Since this character had the name Sir Jarvan, we had a lot of amusing comments in the chat about "Report Jarvan for feeding", after the League of Legends character. Hmmm, a dragon named Jarvan? Another strangely appropriate name. IBS and Ambivelous traits. Now this Lady Dragon was simply hilarious. The Ambivelous trait makes your spells come out backwards, which meant backwards-firing fireballs. Combine this with the Irritated Bowel Syndrome (IBS) trait, and the jokes practically wrote themselves. It *REALLY* looked like this Dragon was shooting out fireball farts. I don't normally go for that kind of crude humor, but even I had to laugh here. It was just so ridiculous to watch! It was also profoundly strange to play in practice. I had to turn around backwards to shoot, while also flying around to dodge stuff, and the whole thing felt very disorienting compared to the non-Dragon characters. I thought that I was doing a little better by the end of this character, who was finished off when two flying charite monsters hit her from above, one of the major weak spots for Dragons. Need to get some vampirism going for lifesteal, and more than the pathetic 86 starting health total! Coprolalia trait. After the last two Dragon characters had tripped over their own two feet repeatedly, I was pleasantly surprised at how well this character did. I still lacked any Vampire or Balance runes for sustain, but I was somehow able to dodge all kinds of hits throughout this run. My Dragon guy was hit exactly one time in clearing the entire castle, and I even found a fountain for a future health refill in the process. The name of the game for this Dragon was runes, as I managed to find five of them over the course of the playthrough, including three of them in the castle alone. 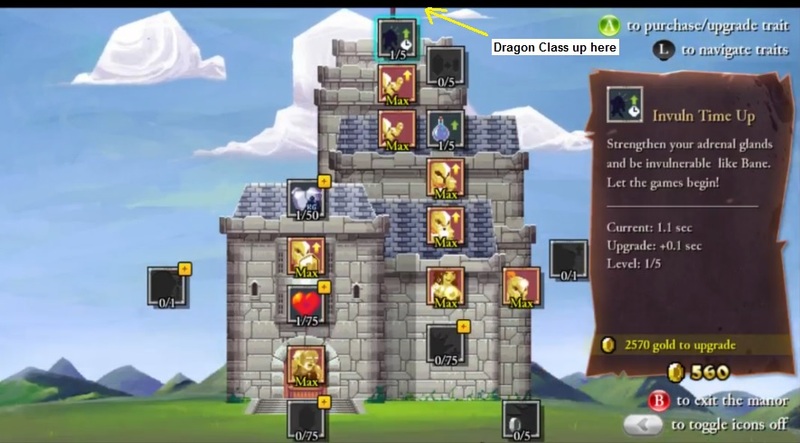 One of the great advantages of the Dragon class is the ability to get many runes with complete ease; all of the challenges where you have to carry out some kind of difficult platforming task become trivial with endless flight. One of these produced my first Vampire Rune, in a room where you have to drop between a series of spikes without getting hit. Not very hard when you can take to the skies! Another "kill all monsters" fairy chest challenge later in the forest produced a second Vampire Rune drop, and now I knew I was in great shape for future characters. The biggest difficulty came in a room with fire traps on the ceiling, restricting my Dragon's free flight. That looks to be a major issue for this class, any room layout where the Dragon can't maneuver properly. With the castle and forest completely finished, I headed up into the tower next, and surprisingly continued to make excellent progress. Two hits would spell certain doom, but the enemies couldn't touch my Dragon as he kept floating and dodging around all attacks. In the end, I was able to clear the entire tower (except one fairy chest room with about a dozen monsters inside), albeit at the cost of dropping down to 20 HP with no recovery items left. Rather than commit suicide in that one unfinished room, I sent this guy down into the basement, where he managed to get through four rooms before finally falling to a pair of tier three flying skullheads (Wraths). They cornered him and I simply did not have enough damage or mana to kill them fast enough. A truly fantastic run with over 10,000 gold brought back! There was enough money to unlock the third Gold Gain upgrade (if not quite enough to get two of them), as well as both Vampire runes. At this point, I realized that I could get a Bounty rune (+10% gold, exactly like another level of Gold Gain Up) for one of the unused rune slots, and I figured that would pay for itself in the time that it took to find a Vampire rune for that same slot. With the remaining cash, I bought the Silver Chestplate, then belatedly realized that I didn't have enough to get the equipment points needed to put it on. Whoops. That was a mistake for sure. Always buy the equipment points first, then the weapon or armor second. Ah well, not a huge deal, just a bit sloppy. Coprolalia and Dyslexia. This Dragon's path was eased enormously by the presence of that new vampirism, +4 health restored per monster kill. I was also getting noticeably more gold as well, 14 gold per coin instead of 12 gold. Together that meant that I would do even better with this Dragon, right? Not necessarily. It would be nice if these runs went in a straight linear path upwards over time, but the actual progress is rarely quite that neat. Dragons are incredibly frail characters, and one or two mistakes can end a run instantly. I was still working with 86 HP max and zero armor, and that was incredibly low. The picture above was a great example of a situation where the Dragon class struggled. I could not hit the fire mages through the wall, which would have been easy with the normal sword, and they were able to toss their own projectiles through the barrier at me. In attempting to fly down to the bottom of the room to fight, my character took a couple of hits and died immediately. A promising run was instantly ended. That's the kind of stuff that can happen all too easily with these fire-breathing characters. With the modest gold returns, I purchased the Ranger Chestplate (an upgrade over the Silver one) to get some armor going, along with the first Mana Cost Down upgrade. That dropped the cost of fireballs from 15 mana down to 14 mana. I would want all of those upgrades in time, even though they can be pricey. Colorblind and OCD traits. I had a long streak of non-Dragon heirs around this time, a period where 7 out of 8 heirs failed to roll the Dragon trait. That's always irritating. 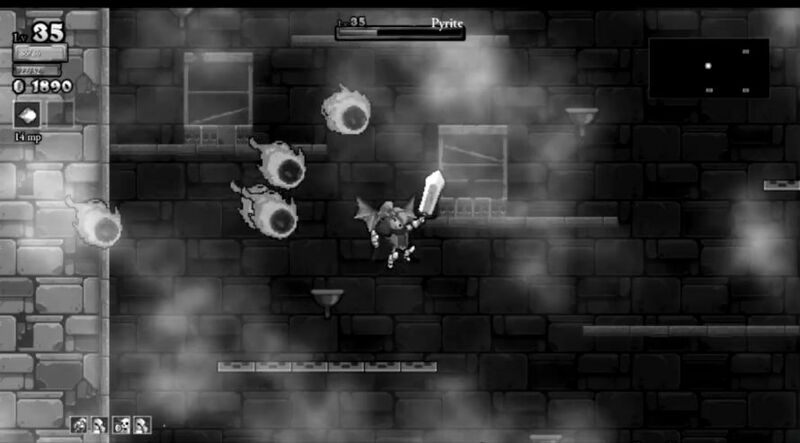 Anyway, this one had the Colorblindness trait to turn the screen black and white, which always attracts some fun comments from Livestream viewers. I opted to head into the tower right away when I found the entrance, hoping to use the easy castle area as a place to restore life via vampirism. This worked well for a good while, as I managed to clear room after room without taking any damage at all. The highlight was flying through a huge room with a swarm of pyrites (flying cloud monsters) in tow. They looked like a flock of birds! 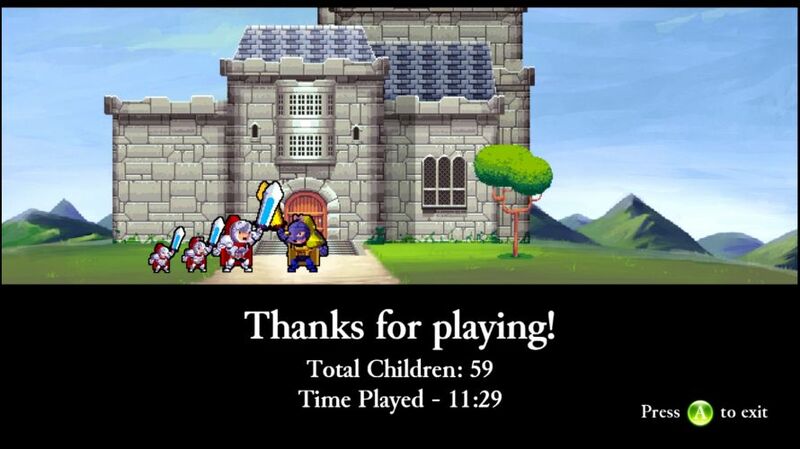 The aerial combat was nothing like any other class in Rogue Legacy, and it was a ton of fun. I felt that I was getting much better at the unique flying movement by now, which requires a different mindset from the standard jumping mechanics. Unfortunately, this came to a halt a few rooms later in rather cheap fashion. A wolf dropped down from a higher platform onto my Dragon's head, and before I could leave the room to go get a recovery item, the wolf hit me a second time and ended the run. From full health to dead in less than two seconds. Who knew Dragons were such frail creatures! I figured that I needed health more than anything, so I spent most of the gold from this run on adding a few more points to that stat. CIP (no lifebar). This is one of the more annoying traits, as it's hard to judge when to fight and when to head back to safer areas to restore lost health via vampirism. Of course, there's another way to deal with CIP trait: don't get hit, which is easier said than done. I made a decent attempt at it here, clearing most of the castle (leaving a few areas undisturbed to rebuild health later) and then venturing through the entire forest. My Dragon was successful at dodging most of the monster attacks, only taking the odd hit here or there in cramped rooms that lacked space to maneuver. Noteworthy events included finding Hedgehog's Curse from a secret shrine - and then replacing it with Hermes' Boots from a second secret shrine, ha! I also found two hidden runes tucked in those cubbyholes in the wall, along with two more runes picked up in normal fashion. Nothing useful, sadly, but at least I was starting to pile up a good collection. Lacking a health bar, I tried to be conservative in farming additional monsters after taking hits, downing more of them than were strictly necessary. I knew I didn't have much margin for error, and that was realized in the tower when I activated an enemy painting in a small room. There wasn't enough space to dodge, I took two hits in a row, and that was that. Death comes quickly to these Dragons. I should probably avoid waking up paintings in the future if there's not enough room. In any case, this was a solid run that returned enough money to pick up the fourth Gold Gain upgrade. Almost there now on the first crucial stat category. Hypergonadism (super knockback) and Tunnel Vision (no early indicators). The extra knockback from Hypergonadism isn't always a good thing with normal characters, as it pushes monsters away from your sword and makes it harder to land multiple hits in succession. It seemed to work like a charm for the Dragon class, however, as the extra knockback provided more safety and extra time for mana to recharge. I was still having problems with running dry on magic points in many fights, the base 32 MP wasn't enough against high health targets. Another stat I needed to upgrade. Anyway, this run started with an easy clear of the forest and most of the castle, saving a couple rooms to be farmed for extra health later. I ran into the duo flying mages minibosses in the castle, and that little skirmish proved to be a lot of fun. 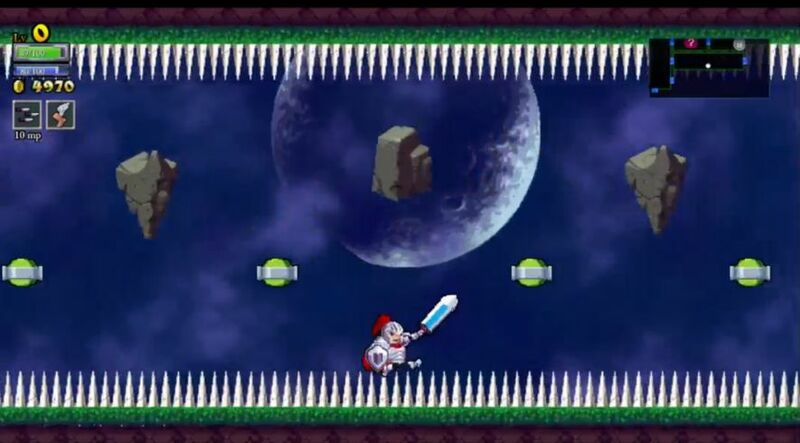 They were definitely easier with the ability to fly between their fireballs and ice shards. My Dragon girl took no damage, and the minibosses even dropped an Armor upgrade in their treasure chest, sweet! The rest of these easier areas were largely uneventful. The tower provided more of a challenge, in particular a "defeat all monsters" fairy chest room where I had to make a retreat back to the castle to restore life via vampirism. I did clear out that room with some fancy flying around a whole bunch of enemy mages. With the tower out of the way, it was time to venture down into the basement, and this was the first Dragon character to make significant progress there. 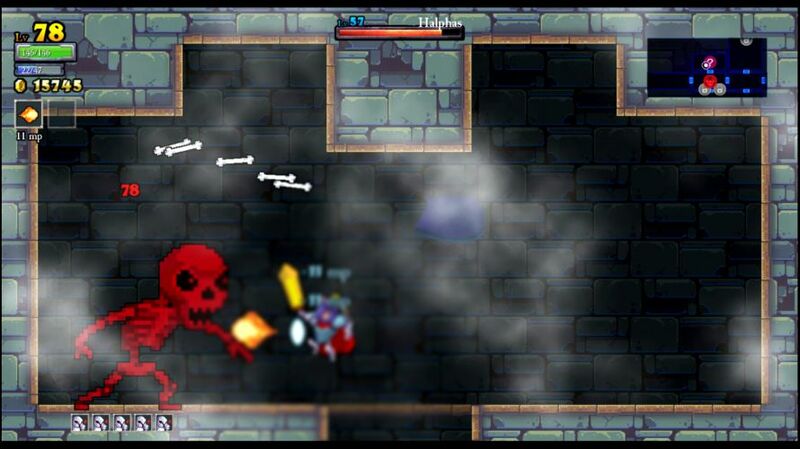 Monsters had notably more health, and it was taking four or five hits apiece to down them. This was a bit of an issue when there was only enough mana to get off three fireballs before needing to wait for mana to refill! Nevertheless, somewhat to my surprise I managed to clear well over a dozen rooms. Right when I was about to die, I found the tower boss room, which allowed me to retreat back to all of the other teleporters and raid their chickens for a full health restore. That got my Dragon through even more rooms. (Weirdly, I wasn't taking hits from the monsters often, but I did manage to walk into two spike traps and a fire shooter, argh!) 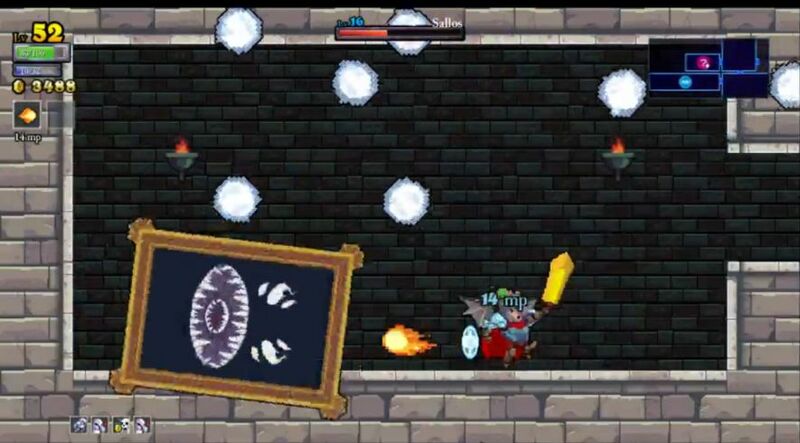 In the end, a pathetic tier one eyeball managed to land the killing blow from behind a wall, the little red projectile hard to see on the dark screen. A cheap way for the run to end, but a marvellous one in terms of results. This money went into the final Gold Gain Up level - at a cool 10k price! Expensive. Such a lengthy run had also picked up five new runes (nothing useful) and seven new pieces of gear. I put most of the rest of the cash into using those, grabbing eight points of equipment weight along with the Guardian Sword, Sky Chestplate, and Ranger Limbs. I was just short of money to purchase the Ranger Helm as well, and therefore picked up the Architect unlock with the minimal remaining gold. The net effect of this was a huge increase in Armor, nearly doubling the value and going from 15% damage reduction to 25% damage reduction. Now I would need more health upgrades to make use of that extra defense. Well, that along with more magic damage... and more mana... and then there were still the Potion Up and Mana Cost Down and Invuln Time Up upgrades to work through... Hmmph. Better get back to more cash grinding! Coprolalia and Endomorph. I went into the tower to start this run, and had the good luck to turn up a new Vampire rune almost immediately from a fairy chest. That would be an easy purchase after this lady Dragon perished - it's pretty much impossible to have too much vampirism. Two hits to an evil painting nearly killed my character, forcing a retreat back to the castle to refill health for awhile. It's important to keep the frail nature of the Dragon in mind constantly while playing; you can be sailing along on cruise control, and then be on the verge of death (or actually dead!) in an instant. 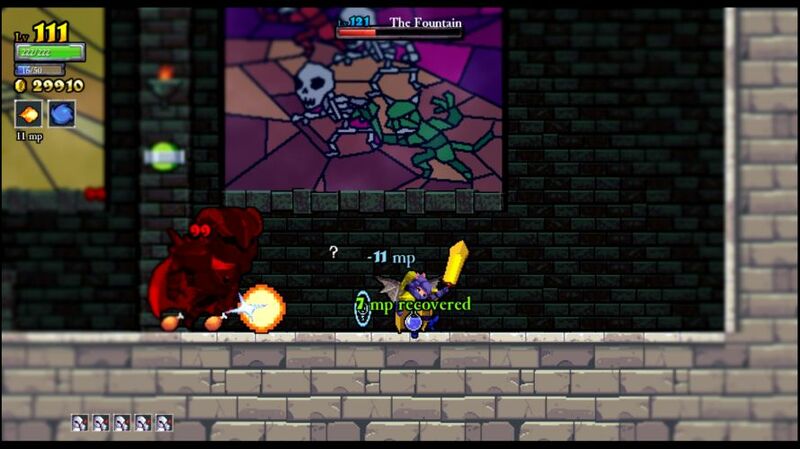 While in the castle, I had the chance to take on the Sallos miniboss, an encounter that I usually pass up. It went reasonably well, I took one hit while earning victory. I've gotten a lot better at fighting them over the last year. Back in the tower, I fought Botis again and he produced a Mana Up bonus, very nice. I mean, it added exactly 1 point of max mana, but I'd still take it. 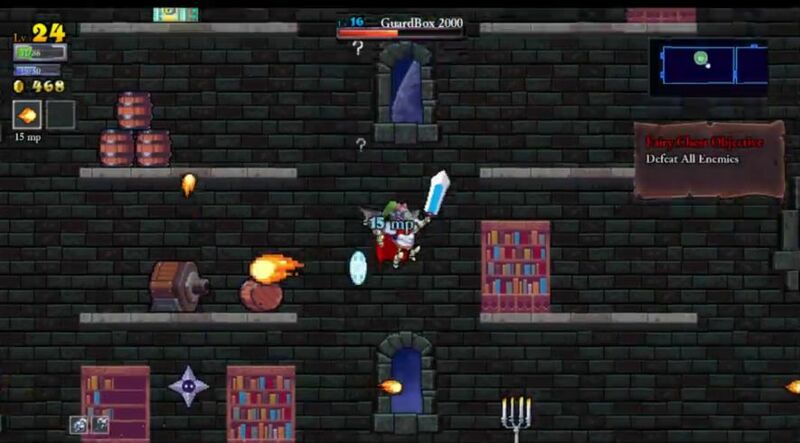 Another hit in the tower in a fairy chest room meant another retreat back to the castle... you know the drill by now. The net result was that I full cleared the castle and a fair portion of the forest before making my way through the rest of the tower. The remaining forest had relatively little of interest, other than a few more runes from fairy chests and the appearance of Calypso's Compass from a secret shrine. The hidden door turned out to be located in the basement, and that was the only remaining area yet to be done, so down we went into the darkness. An obnoxiously placed bouncing spiked ball knocked my Dragon as low as 6 HP, and forced her to eat all of the saved up chickens at the teleporters. With resources drained, I didn't expect to make it much further, only to have a slick run continue to clear room after room. I did find the secret door from the Compass, although it sadly had only two pieces of Retribution gear inside. Not useful. Better was turning up rune #7 of the run, which turned out to be another Vampire one. Excellent, we'd be up to +8 HP per monster kill after this. Eventually it was all cleared out, first Dragon to get a complete dungeon map. This left the four bosses, none of whom I had attempted yet. The Dragon class generally does well against bosses due to the free flying movement, and this was very much in evidence against Khidr. The floor spikes in the corners were rendered useless, and all I had to do was fly between the red goo. Easy stuff. The big eyeball never touched me. The largest problem was running out of mana; I could only shoot three fireballs before draining the entire (tiny) mana bar. Alexander was up next, and he worried me a bit. The little flying skullheads that he spawns had the potential to overwhelm my character, since the low damage output of the Dragon meant that this battle was going to take a while. Fortunately all of the minions would die in one hit, and they provided very helpful extra health when they died, otherwise this battle probably would have been impossible. I was nearly swarmed at the end of the battle, but did manage to get it done OK. The death explosions of all the minions even restored my Dragon to full health, hah! The next boss fight against Ponce went exactly as expected, with the big fireball chasing my Dragon endlessly around the room. He managed a single hit when the bouncing spiked balls cornered my character in a weird pattern, no escape possible. It's a good thing that I only took a single hit, because two hits would have spelled death. Not much room for error there. I expected to die against Herodotus, especially when I discovered that each blob would take four hits to defeat. At best, this was going to be a long and grueling struggle... and that's exactly what it turned out to be. The ability to fly took the floor spikes out of the equation, and I could hover at the top of the room in complete safety at any time. This allowed my Dragon to pull divide and conquer tactics against the blobs, only focusing down the small ones, and gradually wear them down. Getting back 4 health per kill was another lifesaver. There were no true close calls here, just a long and tense engagement (eight minutes according to the Livestream footage). I played it cool and calm, and eventually won the fight, much to my own surprise. The final bosses were another story. Johannes hit me with one of his blade walls, and then he hit me in the corner for the two shot kill. Yes, these Dragons are fragile! Still, that had been a 55k gold run and a clear of all four bosses, so I was hardly disappointed. I elected to use the money to fill out most of the remaining utility upgrades, maxing out the Potion Up and Mana Cost Down levels. This did little to make my character immediately stronger, but both would be incredibly useful over the course of the many future runs to come. The rest went into using the two new Vampire Runes, along with some of the gear upgrades found along the way: the Imperial Helm and the Sky Bracers. This would leave me free to begun pumping stats in earnest with future Dragons. Hypochondriac. I knew that this character would be a bit anticlimactic after the last run. With no more bosses to fight (other than the final duo), the goal here was to full clear the dungeon once again and accumulate as much cash as possible for future characters. At only Level 63, with only 14 points of Health and 5 points of Intelligence, I doubted that I was anywhere near strong enough to defeat the Fountain. With the two new Vampire runes, I was getting +8 health per monster kill, which turned the castle and forest into complete cakewalks. There was no challenge in these areas. More interesting was a battle against the duo plant minibosses in the tower, who managed to hit me twice and then dropped a useless piece of Sage gear. Then I fought the duo flying mage minibosses, who also left me another Sage item. Probably not worth the effort, although I do enjoy the challenge. One thing that was noticeable with this Dragon was the increased ability to spam fireballs. All of the Mana Cost Down upgrades dropped the price of fireballs from 15 mana down to 11 mana, and that along with a whole bunch of Mana Up bonuses from the bosses on the last run had increased my Dragons from 32 MP up to 45 MP. Now I could use five of them in a row without running out of juice (with mana regen), which was a huge upgrade from the previous three at a time. I took some hits at times in the basement but generally had an easy time of it, only having to retreat into the forest one time to rebuild health. The highlight from that area was finding the fifth and final Vampire rune down there, very nice. Otherwise this was a routine full clear of the dungeon, piling up a good sum of 39k gold, thanks in part to a secret shrine dropping Helios' Blessing along the way. That left the last bosses, and this time I managed to put up a better fight. I flew around Johannes, trying to prevent him from ever closing to melee range, dodging his axes and daggers along the way. This was a long and difficult duel, not helped by the fact that three hits would kill my Dragon while it took about thirty hits to defeat Johannes. I did manage to win with a sliver of health left, taking two injuries while avoiding the would-be fatal blow. Against the Fountain, it was another story. I was unable to avoid his flying sword projectiles, and two of them immediately impaled my Dragon. It looked like I still needed some more stats to defeat the second boss. I used the gold to max out the Invuln Time Up levels (which are expensive but extremely helpful) and then dropped the rest into genuine stats. Give me as much Health and Intelligence (fireball damage) as possible, please! OCD and Farsighted traits. I went through 11 consecutive heirs without getting a Dragon, the worst such streak ever for me. The odds of that were well under one percent! Well, no Randomize Children skill just yet, although I was likely to get it soon. Anyway, this was a fairly uninteresting character to play out. I've run into this a number of times with past class challenges at the end of Normal difficulty, where the dungeon itself doesn't present a challenge anymore, but the last two bosses are still out of reach. 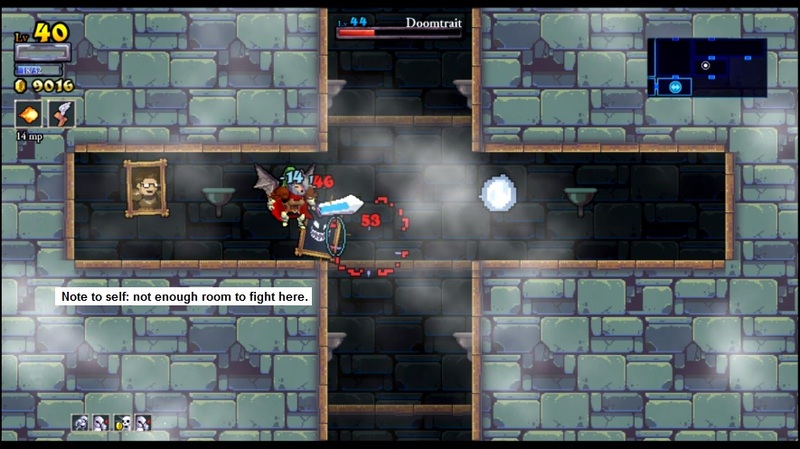 On Normal, Johannes and the Fountain are MUCH harder than the regular enemies in the basement. Strangely enough, this dynamic is completely reversed by the end of NG++ difficulty, where the last two bosses are kind of a joke compared to a simple clear of the whole dungeon. I was eager to move on to the next difficulty level, but there was nothing to be done right now other than continuing to full clear and pile up more income for extra stat upgrades. The most interesting highlight of the run was a miniboss fight against the duo skeletons up in the tower. These guys are normally pretty easy, but I found myself getting hit repeatedly, having to retreat out of the room twice to get more health. What was I missing here? Then it hit me: normally I'm on the ground for this miniboss battle. This makes it easier to dodge their bones, which spread out in an arc as they throw them. Instead, I was flying around up in the air with this Dragon, putting me right in the way of their projectiles. Whoops! As soon as I landed, I won the fight without issue. This was one situation where flying was a bad idea. Eventually, this produced another full dungeon clear with a little over 30k gold in the bank. (It wasn't entirely without issue though; I had to retreat back into safer areas to farm more health a couple times. I can't stress enough the fragility of the Dragon class. You're like a porcelain vase that breathes fire.) I did better against the final bosses this time, winning against Johannes without much trouble. I think he hit me once. The Fountain continued to be a roadblock, however, as I didn't do a good enough job of dodging the flying swords. Three hits was still enough to kill my Dragon from full health. There just wasn't much room for error, as always with this class. Well, more health and more damage would help solve that problem. Time to try again. OCD and Muscle Weakness. The OCD trait was irrelevant (extra MP back from breaking items in the dungeon) but Muscle Weakness removes all knockback from your attacks, and that one truly does make the game harder. Certain enemies like the flying clouds and the wolves will charge straight at your character, and even the flying mages turn into suicide bombers. Playing so many characters in Rogue Legacy has wired my brain to expect the monsters to get knocked back upon taking damage, and when that doesn't happen it always confuses me. Despite that handicap, this run went extremely well while carrying out another routine full clear. All four regions were randomly generated larger than normal, and not a single gold treasure chest spawned behind an unreachable wall. I was able to collect every last one of them, which is exceedingly rare. 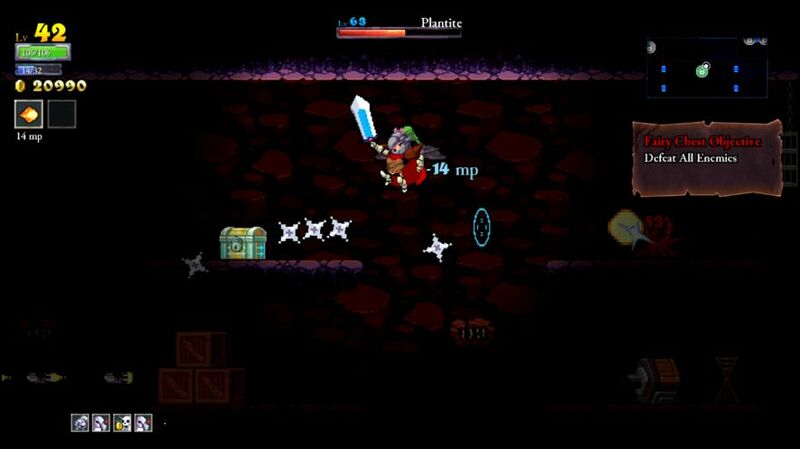 There were also lots of runes to grab in fairy chests, six or seven in total, and many minibosses to fight. I defeated Botis, the bone-tossing skeleton duo, the flying mage pair (twice! 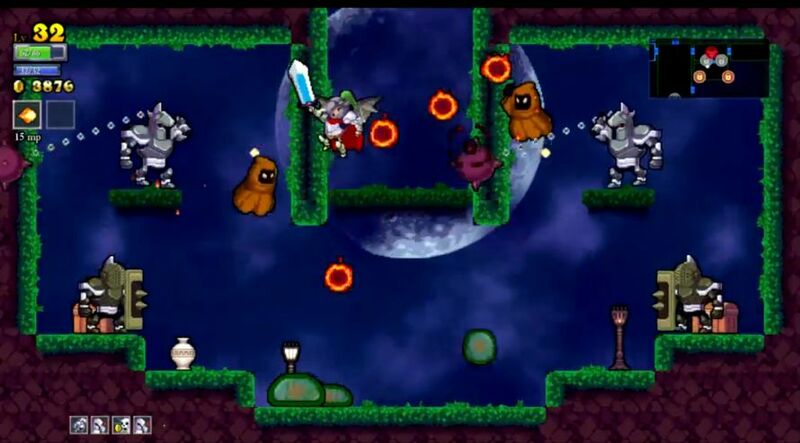 ), and even the plant minibosses. Two major equipment upgrades appeared along the way, in the form of the Guardian Chestplate and the Guardian Cape. The former was an improvement over the Sky Chestplate, while I wasn't wearing any cape at all for lack of useful options. They would be picked up after this run. When all was said and done, I came away with 43k gold in the bank, an increase of nearly 50% over the previous character while clearing the same real estate. Sadly the lack of any knockback was a major weakness against Johannes, as I was unable to push him away from my Dragon. The boss kept running right into my face and getting in hits. I was unable to get past the first phase this time. Not the first character to be in this situation either, Muscle Weakness makes the Johannes fighht immensely more difficult. The gold went into using the two new Guardian pieces of gear, which left my Dragons looking like they were wearing a banana suit. Yellow everywhere! It made for good protection though, as they went from 62 armor (23% damage reduction) to 111 armor (35% reduction). The rest of the money was spent on a whole bunch of Health upgrades, nine in total, along with a few more points in Intelligence to increase fireball damage. I worked out the math, and it suggested that the health + armor combo had increased effective total life by about 30% over the previous character. I hoped that would be enough to defeat the final bosses. Ambivelous and Nearsighted. 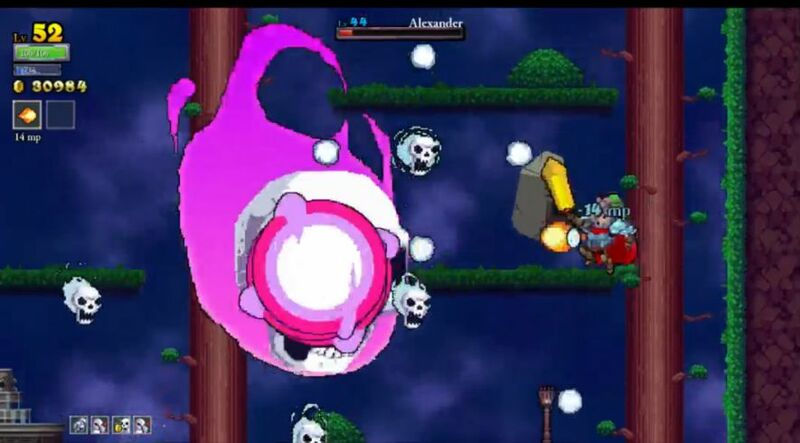 These were annoying traits to have for a long run, with the backwards-firing (farting) fireballs once again mixed together with blurry vision. My hands actually started to get tired about halfway through the run from needing to turn around constantly to shoot out fireballs. Too much rocking back and forth on the D-pad to work around that trait. Making matters more irritating was the appearance of the dreaded Hedgehog's Curse in a secret shrine, which of course causes your character to lose gold every time he or she takes damage. It took almost an hour to clear the full dungeon once more with this highly irritating Ambivelous + Nearsighted + Hedgehog's Curse combo. No new weapons or armor on this run, but I did find the last five remaining runes. All of the fairy chests would have stat bonuses from this point forward. The full clear yielded almost exactly 30k gold, which tends to be fairly typical for Normal difficulty. It only highlights how amazing the previous run had been, pulling 43k with no boss rewards to inflate the tally. So that meant that I was going to have to try the final bosses with this weird Dragon setup. Having knockback on my fireballs made such a world of difference against Johannes, I can't stress enough how much easier that made the fight. My lady Dragon shoved him away with her fireball farts when he got too close, and otherwise spent the whole battle dodging axes and knives. I was able to win without taking any damage, allowing me to save the chickens on the ground for the second half of the fight. The Fountain mercifully did not spend too much time summoning his sword projectiles, just one group from the left side and one group from the floor. He concentrated instead on his melee sword swing, which is by far the easiest attack to dodge, doing that move three different times. I concentrated on staying near the bottom of the screen (where you can see the sword projectiles coming up from the floor better) and kept firing away. Soon enough the big guy went down, with my lady Dragon still at full HP. Victory at last. The end of Normal difficulty can often be a bottleneck for many characters classes. It was especially so for these Dragons, as it took five total heirs (each of them full clearing the dungeon) to defeat the last bosses. I think that much of this had to do with the easy access of the Dragon class to lifesteal; since there's no need to equip a Vault Rune and Sprint Rune for the double jump and dash, Dragons can go full hog on Vampire Runes and get as much as +10 HP per monster kill. This allowed my characters to clear the full dungeon repeatedly, using the easier areas to restock health whenever it dropped low. However, lifesteal was useless against the final two bosses, and the pitiful healthbar of the Dragons made them frail targets indeed. I needed more health, more armor, and more damage to make the Johannes and Fountain duels practical. As far as the number of heirs used... sheesh! I rolled through 59 characters and used 15 of them in total. I mentioned that I had rotten luck getting Dragon heirs to spawn, including a period where 19 out of 20 heirs were non-Dragons. Actually, it was worse than that, since each selection gave me a choice of three possible options to pick between. So something like 59 out of 60 heirs all popped up as non-Dragons in one extended period of weird RNG. I've never had to kill off so many characters before. Of course, that's also partly because there were more total classes for the game to roll in this situation, since I needed to unlock everything other than the Shinobi and Lich to get all the way up to the Dragon class. I will definitely be picking up the Randomize Children upgrade soon to relieve some of this tedium. I'm not too terribly concerned about New Game Plus difficulty, the Dragons should be able to deal with that just fine. NG++ mode will be a different story. That's when the real trouble will begin. Stay tuned to find out how that goes.